State government of Rajasthan going to recruit 9912 teacher assistant posts 2013. education department of Rajasthan will develop a new cadre for appointment of teacher. No written exam of interview test would hold for these posts. Selection procedure will be based on the class 10 mark sheet as well as 8 year experience of teaching. Selection process will be finalized by officer of CM office and chief secretary. 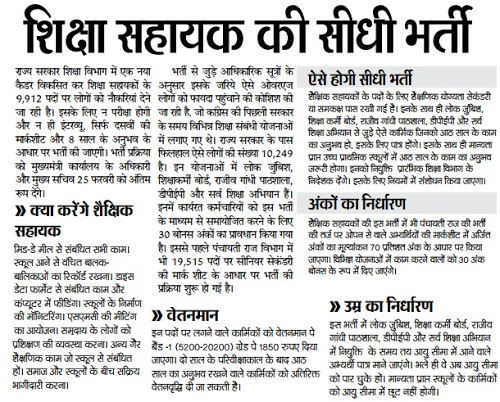 They will work related to mid day meal scheme of government. They will maintain the record for those students who are not coming school. They will also do data feeding work in computer, Dice data format related work, monitoring of school construction, organizing the SMC meeting, Management of training of the people of Smauday, another extra academic work of school , establishment of relation between school and society . Salary: pay band 1 5200- 20200 grade pay 1850 , after two year probation , increment in payment will be increased. Selection Procedure: Education qualification > higher secondary level pass, and 8 year experience of work in primary school.